It’s July 1978, and the summer at its peak with intense, blinding light at 40 degree Celsius. The sky was deeply blue and cloudless, and a young Filipina doctor, born and brought up as a Roman Catholic, arrives in Doha with her husband and two children. The very touching of the Qatari soil is like a dream, for she had neither dreamt of coming to Qatar, a name which she had never heard of before meeting her husband, nor of marrying an Arab cardiologist from Qatar, says Dr Rachel Hajar, a cardiologist and the director of non-invasive cardiology, Hamad Medical Corporation, Doha, and married to Dr Hajar Ahmad Albinali, also a cardiologist and former health minister in Qatar, in the beginning lines of her memoir – My Life in Doha: Between Dream and Reality. 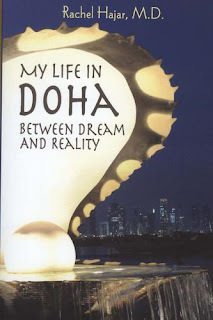 Doha Corniche was the first place she visited after arriving in Doha and she might have never dreamt that the Pearl Oyster Fountain along Doha Corniche would make the cover for her memoir in the later years! The work is remarkable not just because it is written about Arab society and culture, but also because it gives first-hand experience of the author, an outsider, who was accepted by the conservative society with open arms. 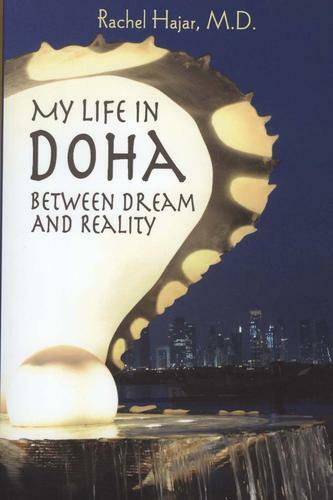 The book is all about her personal experience and narrates how she met her husband and came to live in Qatar. It also gives an insight into her good rapport with her in-laws, recollections of her early experiences and her insights into another culture. She admits that the world was obviously different from the one in which she was brought up and reveals what it is like to live within the heart of a culture that’s not her own and the social changes she has witnessed through the years and most importantly, the evolution of her perspective about the region and its people. 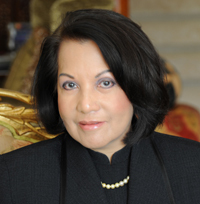 With a physician’s eye for detail, she weaves a fascinating tale of how her love story transcended cultural and social habits in a traditionally patriarchal Arab Islamic culture. She blends art and science in a convincing manner. The chapters read easy and a tinge of humour and stories of the past help the reader to maintain the flow of reading. The author takes fascinating side trips into the history and literature surrounding incense, the Islamic call to prayer, the marketplace, and compares and contrasts Christian and Islamic festivals. As an insider she describes how Qatari kitchens buzz with activity during Ramadan as women prepare and experiment with new recipes for iftar, the breaking of fast. She goes in detail about the traditional delicacies like thareed and harees, “the two dishes known from pre-Islamic days”. (P. 188). Not to leave behind Loqaimat, a desert which inspired her husband to compose a whimsical Arabic verse. She also narrates the stories behind the traditional sweet dishes Mahalabiya and Umm Ali. 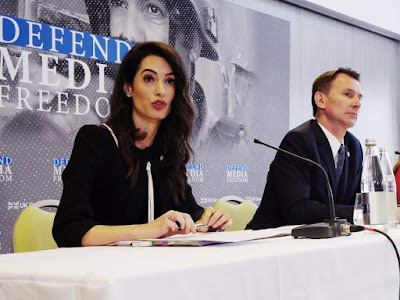 She also examines issues like wearing black veil, history behind it and how being a mother of five children, she volunteered to wear the Qatari veil when her children reach adolescence. She gives a detail account of markets, on how she learnt to shop for fresh fish and carpets in Doha’s markets. She is fascinated about Majilis, where ideas, news and thoughts are exchanged. She gives an insight on the nuances of majilis, serving coffee, an integral part of Arab hospitality, burning incense, driving in Doha, tent parties and farkha, a door within a door. She dedicates two exclusive chapters for her in-laws, one for Abui (my father) and Ummi (my mother). She fondly remembers how her father-in-law, Sheikh Ahmed , became an Islamic judge, his judgments, writings, reading, collection of books, sense of humour, majilis, his curiosity about the contents of Rachel’s “sling bag, which she carried everywhere”, and lastly slow decline of his health and death. Rachel fondly remembers how her mother-in-law, whom she called Ummi baked khubz, mahalla and chebab, besides preparing laban, a sweet dish. Always in her veil, Ummi’s world in the house revolved around kitchen. The author gives an insight into how a whole lamb is cooked in Qatari families. The writer not only goes in detail about anti-smoking campaigned by her husband in the country, but also gives first-hand experience of patients who suffered heart problems, thanks to their habit of smoking. She keeps the tender love which blossomed between her and her husband for the last chapter. She replaces “the sun in his life not only in Portland”, but also in Qatar and “shines over his heart”. The author is fond of flowers and loves watering her plants in the balcony. She likens her wedding and life in Qatar to a lotus flower which adapts and flourishes in a foreign climate. “The lotus flower is exotic. Like me, the flower is foreign in this part of world. But with tender loving care, it might survive and flourish, the way I did.” (P. 286). It is almost impossible to understand a culture by just looking in from outside, which is like peeping through a window at events happening on the street. One has to live the life within a culture to fully comprehend its perceived mysteries. Moreover, it is difficult to get a glimpse of different aspects of Qatari life and Dr Rachel records her observations and impressions of the culture and society in detail throughout.